Have you checked out our newest Keeping Home free eBook? For February, we have the beautiful Rejuvenating Waves Spa Set pattern by Beth Major! The newest addition to our knitting needle line up will make you feel like crafting royalty – say hello to Majestic! Made with the same strong layers of laminated birch that our Rainbow, Sunstruck and Caspian Wood needles, this new and grand colorway is quite regal with it’s waves of purples, blues and teals. Red and Pink Yarn Sale – Ending Soon! Last chance for lovers of pink and red! Our sale of up to 40% off our favorite rosy red and pink yarns* (over 170 colors to choose from, to be exact) is ending soon. So if you’ve got a sweater planned in these colors, or feel the absence of them in your stash, now is the time to stock up! You can find all of the red and pink yarns on sale HERE. What’s your favorite? Mine is Capra in colorway Flamingo. So, so gorgeous! *Sale ends Feb. 10, 2016. Select yarn colors only, limited to stock on hand. No adjustments to prior purchases or to purchases made after this promotion expires. My first love, knitting was quickly followed by dabbling in spinning with a little drop spindle I picked up at my local yarn store in college. I was immediately smitten with the idea that I could spin my very own yarn right there in my dorm room and the rest is history! 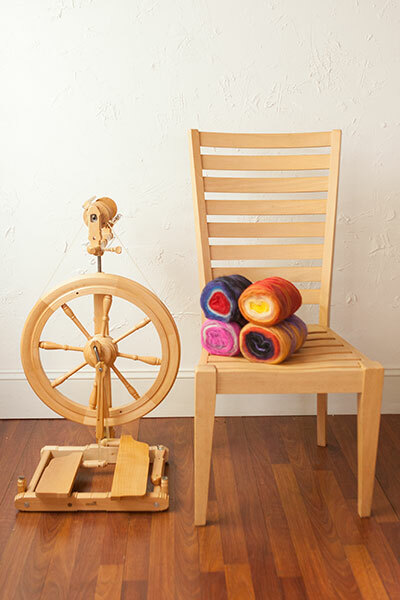 Now, I have a Sonata Spinning Wheel in my craft room, several drop spindles and a funny little vintage spinning wheel that I can tote with me to the park (and yes, that’s definitely a thing I’ve been known to do occasionally). Now that I’ve started weaving in a serious way, I can’t wait to spin yarn specifically to use on my loom too! Whether you’re a beginner spinner, never tried your hand at it or are looking for an interesting book to add to your spinning library, we’ve got you covered with a round up of my favorite tools and books. Book Sale – Last Chance! Since our recent book sale has begun, we’ve highlighted how much we’ve loved Pompom magazine, coloring books, books that highlight alternate ways to use yarn, our favorite crochet books, and so much more. No matter what craft you enjoy, there’s always a book to fill you with inspiration, isn’t there? Our book sale is coming to an end soon, so no matter what books take your fancy, from Weaving to Amigurumi to Star Wars, they’re all 40% off! Get your favorites at a great price, while you can. Want a gorgeous blanket with every color of the rainbow? Download our new free pattern – the Ultimate Knit Palette Blanket! Red & Pink Yarn Sale! February 14th is just around the corner and our Valentine to you is up to 40% off our favorite rosy red and pink yarns* (over 170 colors to choose from, to be exact)! 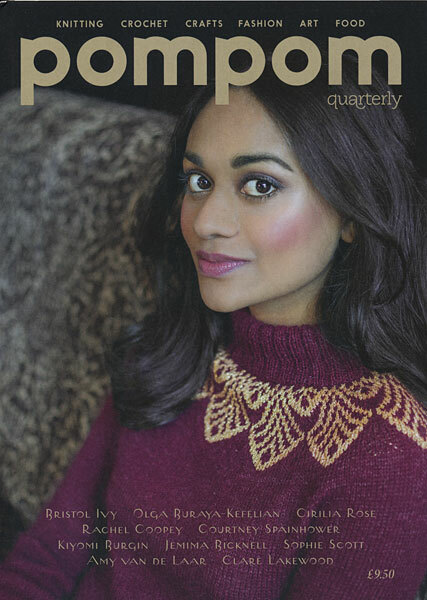 I can’t even begin to tell you how much I love Pompom Quarterly! I’ve been an avid follower since the first issue in 2012 and always look forward to the next installment. I’m so happy that we’re able to carry all of the eBook versions of their publications and have some of the more recent physical copies too! In case you’re new to Pompom Quarterly I thought I would share my very favorite three editions. id you know that every month – we feature a different yarn line to be on sale, all month long? And this month, we are featuring our gorgeous Galileo, at 20% off! A beautiful blend of 50% merino wool and 50% viscose, this yarn makes gorgeous clothing, and luxurious, expensive looking accessories. My favorite is our Piney Ridge Necklace, a superb gift for birthdays and holidays. Why not make some for your girlfriends for Valentine’s Day? At 20% off Galileo, good ideas abound :). We’re celebrating February with all of the rosy pink and red hues that color this lovely month. And although it may be grey and dreary outside, we’ve got plenty of colorful yarns to turn to while we wait for warmer weather. To get the free February 2016 calendar background of your choosing (for smart phones, tablets and desktop computers), simply click the applicable device icon below. Enjoy!